HARRISBURG – Rep. Dan Moul (R-Adams/Franklin) testified before the House Finance Committee today on his legislation to impose an inheritance tax on estate transfers that exceed $250,000. Under current law, all transfers to beneficiaries are taxed. Rep. Moul testified before the House Finance Committee on his legislation to exempt the first $250,000 from the inheritance tax. Under present law all inheritance transfers are taxed. House Bill 1103 would raise the ceiling. 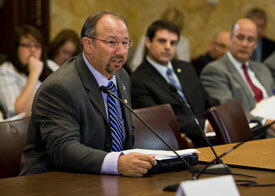 House Bill 1103 is under consideration in the House Finance Committee.